The Los Angeles skyline is iconic, sometimes outranking cities like New York and Chicago's. But it's not just our downtown skyscrapers that have character. Buildings all over the region are beloved for their history and design (and their joyous birthday greetings). And then there's the Kentucky Fried Chicken on the corner of Western Avenue just north of Beverly Boulevard in Koreatown. This isn't your typical KFC restaurant. It has two stories, with a front facade shaped like the bucket of fried chicken you can buy inside. And for its almost 30-year existence, it's drawn plenty of criticism, confusion and love — and made more than one "ugly building" list. But ugly is in the eye of the beholder. Maybe a better understanding of the quirkiness and vision behind the building will help the haters discover it's actually a local gem. The restaurant used to operate in a basic, forgettable building. But between 1989 and 1990, the location underwent reconstruction with one goal: to make a statement and be unlike any other KFC out there. A Martinez, host of KPCC's Take Two, grew up in Koreatown and remembers when the spot was just a run-of-the-mill restaurant. "This was the KFC of my childhood, but it was a one-story, strictly buy-your-chicken-and-eat-it-at-home kind of place," he said. "When it changed it became the quirky KFC that I wanted to stay and dine in." To achieve that quirkiness, the building was designed as a constructivist form of architecture, which is an offshoot of postmodernism. It also has lots of bold forms and jutting geometric shapes typical in Googie-style architecture, which is usually beloved in Los Angeles. The architect at the helm was Frank Gehry protégé Jeffrey Daniels, who also designed David Hockney's residence in the Hollywood Hills and the Edythe and Eli Broad Studios at Cal Arts. "This style is sort of organized chaos so it's hard to make sense of," said Adrian Scott Fine, director of advocacy at the L.A. Conservancy. 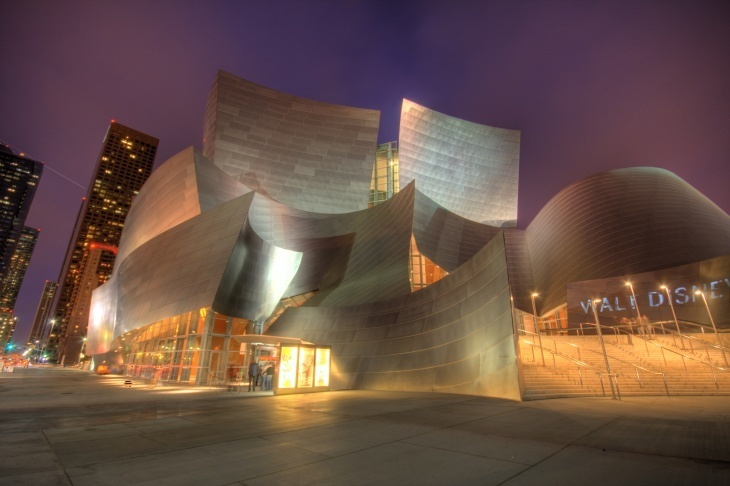 "If you look at the Disney Concert Hall, which most people love and think is beautiful, that's also organized chaos." To Fine, the KFC is not ugly — it's just misunderstood. "Late '80s, early '90s architecture isn't quite yet appreciated," he said. "I say give this building another five to 10 years and you might have somebody that says they think it's pretty or really attractive." Regardless of how you feel about the KFC, its unique design certainly is an attention grabber. "You can't go to any other KFC and have this type of experience in a second-floor dining room and a balcony to look off and see what's going on," said Fine. Buildings nowadays are designed and built for functionality, not creativity, according to Fine. Control and branding are the top goals. "What they were doing in earlier eras was thinking about 'what are we leaving behind for this city? How are we making a mark within Los Angeles?'" Fine said. 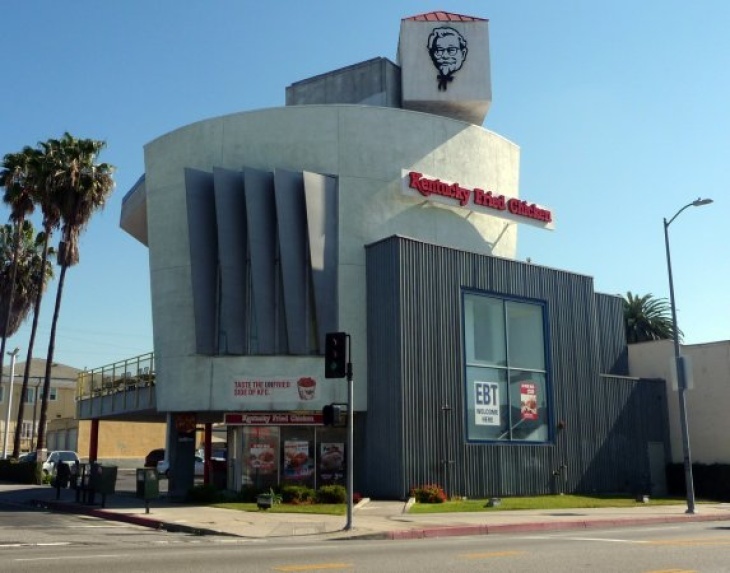 Koreatown's KFC is perhaps the most designed of the chain's buildings in the world, but it probably wouldn't happen today, which makes it a testament to the era it was built in. Fine urged people to try and understand the design age the building came from before jumping to the "U" word. "Think about how architecture was trying to break from traditional forms. It was trying to be its own thing and that's why you have buildings like this," he said. "There was a reason why buildings that are kind of chaotic had a purpose and why they came about and how things evolved from there." What buildings are you curious about in your neighborhood? Tell us below and we'll look into it!